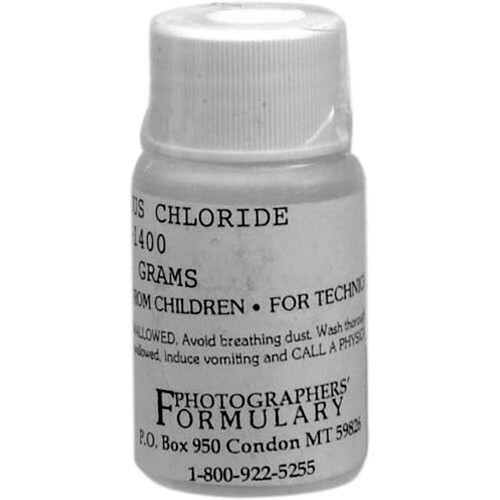 This is 10g of Stannous Chloride from Photographers' Formulary. It is commonly used as a reducing agent and is also an ingredient in solutions for silvering glass and tin toning. Notes Powerful reducing agent. Small quantities of hydrochloric acid are present in aqueous solutions. Absorbs oxygen from air and forms the insoluble oxychloride. Forms an insoluble basic salt when dissolved with much water. Box Dimensions (LxWxH) 3.0 x 1.15 x 1.15"
Stannous Chloride (10g) is rated 5.0 out of 5 by 1. Rated 5 out of 5 by Robert from just what i needed the chemical arrived well-packaged and ready for use in standard lab experimentation. good results right away .